When making decisions about your farm it is important to have all the information at hand. As you can't predict the future it is necessary to look at different outcomes so that you are prepared. For example, what if there was a significant change in the milk payout from what you budgeted for? The ability to copy scenarios allows you see the effect that any change would have on your cashflow and how you would manage the outcome. On the main scenarios tab, click the ... icon to the side of each scenario, and select copy scenario. On the copy screen you have the ability to enter a new name and description, advance the start year and you are also able to extend the length of your scenario using the years dropdown. 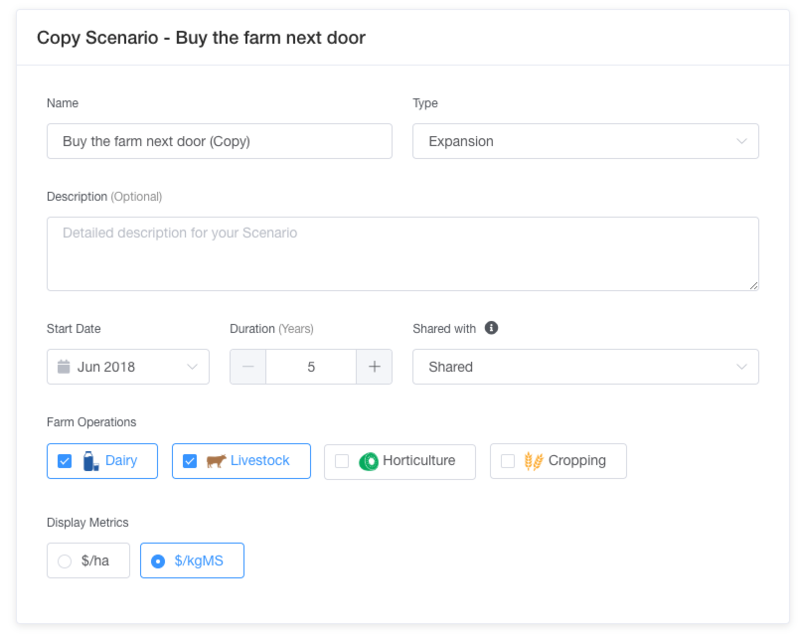 Once you have copied the scenario you will then be taken into the new scenario where you can edit any of the information to suit. If you have advanced the year you will need to add extra data in the final year of your new scenario. Your original scenario will remain unchanged and available for comparison whenever you wish.